Near-death experiences, deathbed visions, and after-death communication are phenomena that social workers in end-of-life settings say clients and their families encounter. Knowing how to respond is the challenge. In 1975, in his groundbreaking work Life After Life, Raymond Moody, MD, coined a phrase to describe what was then a largely unknown phenomenon, the near-death experience (NDE). Forty years later, most people are familiar with at least some of the elements that often constitute such an experience and there have been dozens of research studies published in peer-reviewed journals exploring the origins, characteristics, impact, demographic, and cross-cultural features of these experiences. Less familiar, but known to most social workers in hospice and other end of life settings, is that NDEs are part of a constellation of unexplained phenomena often reported around the time of death. Sometimes referred to as deathbed phenomena or transpersonal end-of-life experiences, these include deathbed visions (DBVs) in which a dying person reports that they are being visited by deceased loved ones or other beings invisible to those around the bedside, and after-death communication (ADC) in which an individual has the sensation or perception of having been visited by a deceased loved one. Research into the origins of these experiences has posited various physiological, pharmacological, and psychological explanations as well as the possibility that consciousness, at least temporarily, survives death, but no definitive explanation has been proven. Given the difficulty of designing controlled experiments into what are spontaneous events often during times of duress, the debate is likely to continue. For social workers serving clients who have experienced or witnessed these events, though, the debate over causation is often less important than other questions: What are the general characteristics of these experiences? What kinds of impact do they typically have on those who report them? 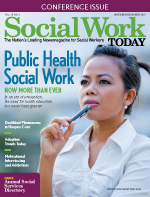 How should social workers respond? NDEs have been reported under various and diverse circumstances. These include during surgery, cardiac arrest, traumatic injury, illness, accidents, suicide attempts, childbirth, and experiences associated with war and combat. According to Janice Holden, EdD, LPC-S, LMFT, NCC, ACMHP, a professor in the department of counseling and higher education at the University of North Texas, "About one in five people who survive a close brush with death report that during the close brush, they had a real or hyper-real experience of their consciousness continuing to function, usually extremely lucidly and from a position apart from their physical bodies." Holden, lead editor of The Handbook of Near-Death Experiences and editor of the Journal of Near-Death Studies, says that during these experiences people typically report that "they perceive their physical bodies, but often away from them—and they perceive and interact with transmaterial environments and entities such as deceased loved ones and/or spiritual beings." Some commonly reported features of this transmaterial environment include an altered sense of time and heightened sensation; the perception of light including the often cited "tunnel of light"; a sense of movement; panoramic life review in which, typically, one relives each moment of one's life; feelings of connection with others; the cosmos or unitive consciousness; and a sense of having reached a boundary which, if crossed, is intuitively understood to mean that one will not be able to return to one's body. Holden makes the point that not all of these features will necessarily occur in any given NDE and that experiences "can range from simple, with few and/or less intense features, to complex, with many and/or more intense features." She says that, in general, the more complex an NDE, the more likely it is that it will lead to tangible alterations in a person's perspective and sense of self. Synthesizing research on the after effects of NDEs, Holden says that the impact may be "psychological, such as loss of fear of death, decreased materialism, and an increased desire to be of service; spiritual, such as an increased interest in spirituality, a sense of ongoing connection to the transcendent, and new psychic abilities; physical, such as a decreased need for sleep, or new food and chemical sensitivities; and social, such as changes in friends." Most people who report NDEs recall pleasurable emotions during the event such as peace, joy, love, and connection, though for a minority the experience can be confusing, frightening, or even horrifying. Some report spontaneously reconnecting with their bodies, others report a moment of choice in which they or an accompanying presence decide that they must return. A common feature of NDEs is seeing dead relatives or comforting figures, often with spiritual meaning or connotation, that seem to be waiting for one's arrival. DBVs are similar in that a patient sees, and may appear to carry on conversations with, visitors who can be identified as deceased loved ones or a comforting other. Unlike NDEs, however, they typically occur when a patient is conscious and has not experienced a sense of having left the body. According to Leslee Curtis, MSW, LGSW, a social worker at Mary T. Hospice, though some patients are able to report that they are experiencing such visitations, others may simply "point to something, maybe in the corner of the room, at the end of the bed, or out the window that they can see but which others cannot." She says other signs include comments such as, "Oh, there is Larry sitting in the chair" or, "Look at the angel;" gestures like reaching out one's arms as if to greet an unseen presence; or a patient who appears to be asleep or in a light coma opening her eyes and saying the name of a deceased loved one. "Clinically," Curtis says, "deathbed visions may be an indicator that death is near." Though research into DBVs is limited, studies thus far confirm this. The largest to date, a retrospective survey of medical professionals in the United States and India by Osis and Haraldsson, concluded that DBVs occur across cultures, tend to be of short duration, and that in 62% of cases reported in their study the patient died within 24 hours of reporting or showing signs of such a vision (Osis & Haraldsson, 1997). The fact that these experiences usually happen in close proximity to death means that the impact on patients must often be inferred from observation, and that establishing prevalence estimates can be tricky (Osis and Haraldsson suggested 25% among those who are dying). Curtis says it is usually family members who make the reports based on observations and experiences they've had as caregivers." I was sitting at the bedside of a patient who had just passed away with the patient's daughter," she recalls. "She told me that early that day he had pointed to the corner of the room up toward the ceiling and said, 'Oh, look, there is Joe.'" As with NDEs, Curtis notes that DBVs often bring a sense of comfort to patients and families and may help reduce anxiety about death. The few empirical studies that exist suggest that patients typically report, or appear to exhibit signs of, peace, love, joy, death acceptance, or a renewed connection with the departed. Another common feature evident in existing research is that these 'visitors' often convey the message that they have arrived to accompany the patient on a journey, or into another mode of existence (Lawrence & Repede, 2013; Fenwick & Brayne, 2011; Muthumana, Kumari, Kellehear, Kumar, & Moosa, 2010-2011; Osis & Haraldsson). Given that these events typically occur in the last weeks to hours of life, many have sought conventional explanations such as hallucinations generated by terminal disease processes, opioid medications, or altered mentation due to extreme stress. While these speculations make sense, others have pointed out that these visions tend to be thematically and sequentially coherent, have contextual meaning, and usually bring positive emotional states, unlike hallucinations associated medications and organic confusional states that are frequently illogical, fragmentary, rarely of deceased loved ones, and are often experienced as distracting, distressing, or irritating. Despite the general tendency of DBVs to bring comfort, this is not always the case. Osis and Haraldsson, for example, found cases, predominantly in their sample from India, for whom the arrival of such a visitor appeared to arouse anxiety and intensify death fear. It's common for hospice social workers serving clients who are grieving to hear reports of "contacts" or "visits" from the deceased. In The Art of Dying: A Journey to Elsewhere, neuropsychiatrist Peter Fenwick and his wife, Elizabeth Fenwick note that research into ADC estimates that between 20% to 50% of grieving individuals report they have had some type of contact with a deceased loved one. According to Peggy Kinney, MSW, LCSW, a bereavement counselor at Duke Hospice, these reports come in many forms. "Some clients report actually seeing a loved one or hearing their voice, others feel a touch or a hug. For others, it may be the smell of a familiar cologne or perfume." Kinney says the range of experiences in which a loved one's presence is felt can also include such things as a strong sense of their presence, vivid dreams, timely coincidences such as malfunctions in electrical appliances, and the appearance, sometimes repeatedly, of animals or objects associated with the deceased. As with NDEs and DBVs, these experiences occur across cultures and gender, tend to bring comfort, and often have positive after effects for those experiencing them. "Typically clients report these experiences bring them a sense of comfort," Kinney says. "For some, these events communicate messages of reassurance or underscore that the relationship, though changed, is ongoing. Others feel a sense of relief, forgiveness, or permission to reinvest in other relationships." Though most ADCs are reported as positive, Kinney says they can raise difficult, even troubling, questions about the nature of reality, personal belief systems, and the nature of a relationship after death has occurred. "Sometimes people ask themselves things like: 'Where is he?' 'What was she trying to tell me?' 'What am I supposed to do with this?' [and] 'Who can I talk with about this?'" Kinney notes that among the many painful aspects of grief may be a sense of deep longing to see a loved one again, if only once more. In some, this longing can manifest in a strong desire, especially if another family member has had an ADC, to have this kind of transpersonal contact. Kinney says some who long for such reassurance feel sad, resentful, or left out when no ADC occurs and this may need to be addressed within a therapeutic setting. The fact that these experiences often occur during times of stress and longing has led some to suggest they may be the result of imagination or unconscious wish-fulfillment; others point out, however, that these events can occur spontaneously years after a death and that many who experience them are initially puzzled, even unnerved. Kinney urges social workers to keep in mind that, "whatever is behind these events, for most of the clients I've had who report them they are very real, and that's what matters." In general these phenomena share some common characteristics. All involve an altered, even transpersonal, sense of reality, tend to reduce fear of death, bring feelings of joy, peace, or acceptance, and imply connection with a broader reality beyond human form. Holden says these events can also alter one's sense of self and the meaning of one's relationships. "Social workers," she says, "can be on the alert for such developments and use their knowledge base to help individuals and family systems reorganize if necessary." Kinney points out that, in the case of ADC, "People who are grieving often already feel out of sync with others who do not understand or do not want to hear about their grief. As such, they have often had their experiences invalidated by messages to move on, get back to normal, and put things in the past. When they have these meaningful, but unusual, events in the context of this existing sense of isolation and being misunderstood, speaking up truthfully can feel risky and unsafe." Hospice social workers are skilled at building relationships in which safety and trust are priorities. As such, they are in an important position to provide needed support to patients and families. This is especially true when they have knowledge about the research on the content and after effects of these phenomena, a respect for the client's lived experience and right to decide what it means, and when they are able to convey openness to discussing anything the client wishes to bring up. Kinney likes to allow clients to take the initiative in bringing up any transpersonal experiences, though when providing practical information about bereavement she often mentions ADC. "This lets the client know I'm aware of such things and that it's safe to talk if they decide to bring it up." She also listens closely for signs that a client may be "testing the waters to see if it's okay to tell me something unusual. Maybe an offhand comment like, 'I really thought I was going over the deep end last Tuesday' or 'I bet people tell you some crazy things.'" If clients seem to be probing in this way, she says she occasionally asks directly about whether the client has experienced anything out of the ordinary. Holden takes a more direct approach. "If a client has a history of surviving a close brush with death, a social worker can say something like, 'I noticed you survived an episode of cardiac arrest. Most people who go through that experience don't remember anything unusual, but some recall an experience in which their consciousness continued to function outside their bodies. Either case is normal, but if you remember anything you'd like to discuss, I'm here to talk with you.'" Curtis adds that inquiring in a way that conveys empathy and openness not only offers an opportunity to those for whom the experience was positive to process the meaning of these events, it encourages those for whom the experience was troubling not to remain isolated. Holden, who teaches a course on the transpersonal perspective in counseling, has developed an informational handout for mental health and health care professionals on navigating these conversations. This handout is available to interested readers at www.coe.unt.edu/sites/default/files/22/129/14_NDE_Acronym_Handout.pdf. In a study in Archives of Gerontology and Geriatrics, Fenwick and colleagues surveyed professionals working in hospice and nursing home settings and found that more than 90% stated that they "would like to see more widely available information for staff, patients, and relatives" related to these phenomena (Fenwick, Lovelace, & Brayne, 2009). Holden, Curtis, and Kinney agree that there is a need for professional education and training in recognizing, understanding, and responding to patients and clients who have had or witnessed these events. In the meantime, Kinney says social workers can serve as models by "listening without judgment, being curious and open-minded, letting people decide for themselves what their experiences mean, normalizing experiences, and, where appropriate, providing practical information to clients and peers. And when someone is making comments suggestive that they have experienced something unusual, responding with warmth, compassion and respect." Fenwick, P., & Brayne, S. (2011). End-of-life experiences: Reaching out for compassion, communication, and connection-making of deathbed visions and coincidences. American Journal of Hospice and Palliative Care, 28(10), 7-15. Fenwick, P., Lovelace, H., & Brayne, S. (2009). Comfort for the dying: Five year retrospective and one year prospective studies of end of life experiences. Archives of Gerontology and Geriatrics, 51(2), 173-179. Holden, J. M., Kinsey, L., & Moore, T. R. (2014). Disclosing near-death experiences to professional healthcare providers and non-professionals. Spirituality in Clinical Practice, 1(4), 278-287. Lawrence, M., & Repede, E. (2013). The incidence of deathbed communications and their impact on the dying process. American Journal of Hospice and Palliative Care, 30(7), 632-639. Muthumana, S.P., Kumari, M., Kellehear, A., Kumar, S., & Moosa, F. (2010-2011). Deathbed visions from India: A study of family observations in northern Kerala. Omega, 62(2), 97-109. Osis, K., & Haraldsson, E. (1997). At the hour of death. 3rd Ed. Norwalk, CT: Hastings House.